Description: The three g1 nuclei belong to two gland cells that fill the most anterior and most posterior regions of the terminal bulb. g1P and g1AR belong to the same cell. These cells extend three processes anteriorly in dorsal and subventral locations. The two subventral processes end just posterior to the metacorpus. The dorsal process en tends almost to the buccal cavity. All three processes are exposed to the pharyngeal lumen at their tips. Identification: All three g1 nuclei are large fried eggs. 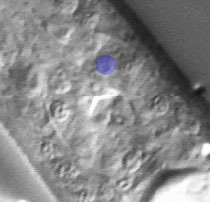 Together with the lateral and dorsal pm5 nuclei they form a triangular cluster in the subdorsal anterior terminal bulb, dorsal to the pm5V nuclei. Each g1A is anterior ventral of a neuron (M1 on the right, I6 on the left). g1P is in right posterior subdorsal terminal bulb, just dorsal to mc2DR. pm5R, M1, g1P, and mc2DR form an easily recognized trapezoid.